Esports might seem like a recent phenomenon in sports television, but, for the team at BlackStar Group, professional, competitive gaming has been a vibrant passion project for many years. The company provides technical services to address onsite network latency as well as network security and supports the needs of esports venues, live streaming, virtual and augmented reality, and more. In February, BlackStar Group took on the network and Wi-Fi needs for a two-day festival during NBA All-Star Weekend. 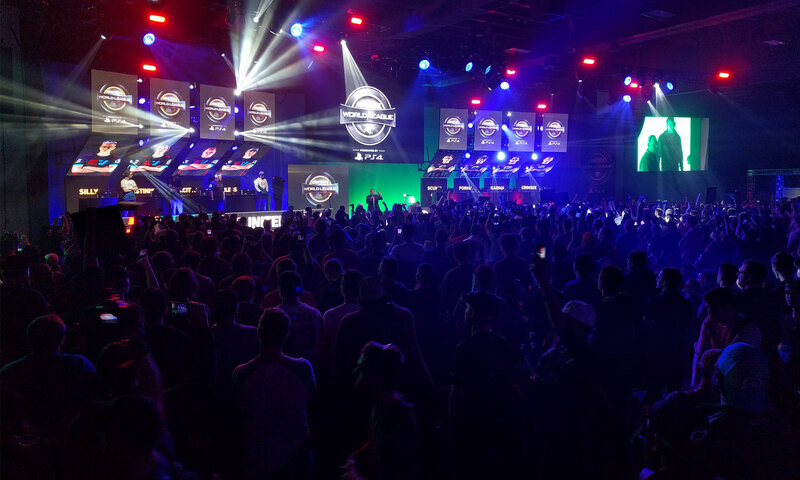 The company leveraged Camplex Broadcast tactical fiber optics to construct the backbone of the network to provide an optimal experience for gamers and fans alike within the 600,000-sq.-ft. industrial venue. The company regularly works with Major League Gaming, EA Sports, and World of Warcraft, among others, and, increasingly, is getting into experience-based marketing events like Adidas’s recent warehouse launch and block party in Los Angeles. SVG sat down with BlackStar Group CEO/Co-Owner/Chief Engineer Chris Hendrie and Director, Business Development, Adam Flynn to discuss how the company got its start in esports, how they work with the venues and tournaments to address technical considerations, and how esports will continue to grow in significance. Tell me a little bit about BlackStar Group and how you came to be involved in esports. Chris Hendrie: It’s been about a decade now, but, back in the day, it was a hobby project of mine. We would go to smaller shows and just help out, like volunteer work, and it became apparent that nobody was focusing on the tech side of how to build these shows. [The thought was that you could] bring your laptop from home and run everything off that and it would be fine. I think we started realizing that there was a need for robust solutions, especially for some of these shows where they might a have million-dollar-plus budget but were relying on a LinkSys router to power everything. We tried to fill that gap and apply enterprise-grade solutions that exist for three days and then go back in the box. Some BlackStar Group clients already have dedicated venues. We work with these venues and [decide whether to] use their existing infrastructure. We’ve had some buildings that are great to work with and then others that we literally ask for the keys to their closet and replace their gear with ours. Adam Flynn: A lot of the work that we do is extremely temporary. A few clients that we work with have permanent facilities, and we’re looking forward to how esports is growing with the building of arenas. Hopefully, we can help influence and aid that infrastructure being built so we don’t have to do as much. What are some of the biggest technical considerations for esports productions, and what does BlackStar provide? CH: The two biggest things that we get asked for are latency and security. All these games are online-based now; back in the day, it was more local LAN, so you just had to have a fast network between the stations. More and more of these games are moving to online servers where the 100+ PS4s in the venue all have to talk to PlayStation Network (PSN), talk to their game developers and servers, and every millisecond matters for that. On the flip side, we have to defend against DDoS [distributed-denial-of-service] and other attacks where people are trying to take down the gameplay, the stream, etc. Those are our two core services where we’re providing the fastest network possible to get your gameplay going and then protecting it against people trying to take down your stream. AF: On the front end of things, because of the importance of social media, Wi-Fi and streaming are so visible. We provide the network support for that. To provide network latency and security, do you provide your own proprietary gear? Or do you rely on other companies’ technology? CH: It’s a mix of both. We build our own edge equipment, and that handles not only the back-of-house stuff but also, as Adam mentioned, the front-of-house. We treat all the networks we support as the same, and so we need to secure not only the streaming and gameplay networks but also the Wi-Fi as well. Someone on the Wi-Fi could cause just as much damage as somebody plugging into the back of a production desk. For the hardware, it’s a mix of custom hardware; we work with Supermicro to design hardware that can basically throughput the [greatest number] of packets possible, and we then layer our software on top of that hardware. For an esports event, what kind of staffing and tech complement do you roll in with? CH: It’s very case-by-case. We work with our clients from the moment we are brought on by them to figure out what their needs are. One of the things we pride ourselves on is that our gear is modular. For the smallest show, if they decide the week before the show they want to double everything, it isn’t a huge problem because we just put in another piece of equipment; it bolts right in and activates as part of that core build. Staffing-wise, we’ve gotten a lot of feedback where the general gist is, what you guys did with three people we would have sent 12 to do. A big part of that is, our technicians are very highly skilled in the way we build things. They’re very good at rolling out our complete network in a couple days, and we support them with the best hardware possible so there’s [never a situation where] we’re waiting for a hard drive to transfer for six hours. How do you see the significance of esports’ rising? What is the greatest potential and growth opportunity for esports? CH: I am a little biased on this because it’s our core. One of the biggest things is, with the way the publishers, especially Blizzard, are handling their league plans for Overwatch League. They’re talking about other titles; they’re setting the framework for how all this is going to work, not just for the next year but for the next five to 10. It’s going to set a precedent for how everything gets built. One of the big things we’ve been looking at — and Adam’s been working on — is a plan for the stadiums. I don’t know if they’re going to be NFL-size stadiums, but Overwatch League is requiring every team to have a dedicated facility where the team plays and practices. That’s a mandate by 2020, or you lose your team license. So we’ve got a bunch of teams that are curating their roster and building their social-media image but have no idea what they need to properly build a stadium: they’re used to renting an apartment or a house, throwing a cable modem in, and calling it a day. AF: I’m very interested in the physical structure and getting that infrastructure built up not just for one particular application of the Overwatch League but for all kinds of venues. Unique venues are cool and very trendy, but, if the infrastructure is there, [it doesn’t matter what the venue looks like because] the venue is going to be able to attract all kinds of new and different and exciting things. I think that we’re in a unique spot to be able to influence how that has happened and then, hopefully, help that along. CH: I don’t think many people that come to us don’t know how we do things, [but there are] still some that are of the mindset that they can just plug in a router and do what we do. That’s not the case at all: we make sure that our equipment is very up-to-date; we don’t slack on quality, either equipment-wise or service. It can be a little bit daunting for some of our newer clients to appreciate the importance of everything we do and what it takes to get there, but that’s why we exist: it takes a lot to do what we do, and we want our clients not to have to worry about taking that all on themselves.